14-inch (35.6 cm) projectiles on deck of the U.S. Navy battleship USS New Mexico (BB-40), while the battleship was replenishing her ammunition supply prior to the invasion of Guam, July 1944. There would be no discernible list, and ships of that size have a whole series of ballast tanks to adjust for different load patterns. Load calculations are usually one of the Chief Engineer's primary responsibilities. My Dad had for many years an ashtray made from one of those shells, with a cork knob in the center to tap your pipe on. That brass was heavy, and it was only the bottom 3" or so of the shell. Wish I knew what happened to it, it was always on the table when I was growing up, but it's been gone for a long time now. 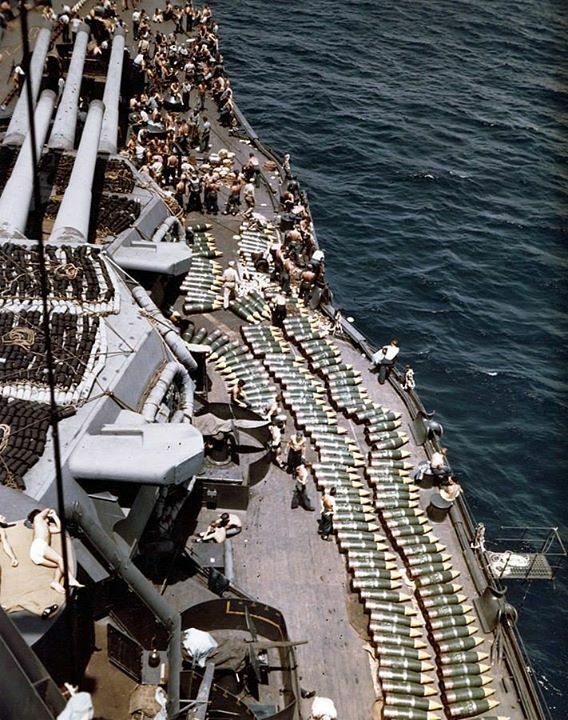 At about 2200# per shell thats a helluva lot of hurt sitting on deck.